A safe guess would be that most audiences coming to see New Light Theater Project’s adaptation of Alexandre Dumas’ The Count of Monte Cristo, one of most classic and exhilarating works of all time, are quite familiar with the material. A tragic tale of a man imprisoned for a crime he didn’t commit leads sailor Edmund Dantes to seek justice as he becomes the wealthy Count of Monte Cristo. 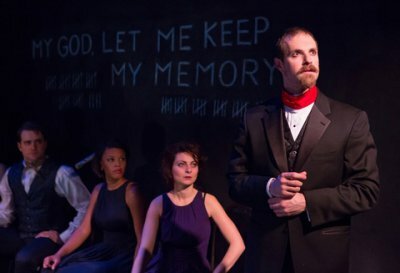 Monte Cristo, written by Jared Reinmuth, with direction by Cailin Heffernan, brings an interesting and lively interpretation to this infamous tale. As a whole, the members of New Light Theater Project are a spirited bunch and it is apparent that they have a strong passion for performing and engaging the theater community. Leading the cast as Monte Cristo is Tom Frank whose dominant presence brings the novel to life on stage. Alana Barrett-Adkins, who plays Mercedes, embodies the elegance and sophistication of Monte Cristo’s one time fiancée. At first glance, her regal manners take prominence, but eventually give way to deeper examination of her inner self. A good-sized cast of almost 15 occupies the stage, even when not directly involved in a scene. Credit is due for the actors being as still as statues, but is at times a lot to follow and a tad distracting. While lively, a number of scenes could have used a bit more cohesion and polish, in terms of line delivery and overall presentation. A fun twist is the score by Henry Aronson, which provides an upbeat sound with hints of guitar and catchy melodies. The cast gets into a celebratory mood and joins together in dance to lighten up the heavier content. These entertaining breaks are necessary for a production over two hours in length. Costume designer Cheryl McCarron takes inspiration from a modern bridal party, with gowns and suits for both sexes matching in design and color. In this case, the dreaded “bridesmaid dress” works and keeps things consistent among the substantial cast. The scenic designer, Sarah Lambert, stays true to the isolated jail cell environment, with minimal props, stylized sets, and the haunting words, “My God, Let Me Keep My Memory,” written in white chalk with a tally count of days overhead as way to further hit home the struggle of losing one’s mind. 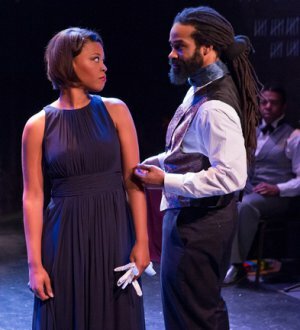 Fans of this epic tale will enjoy New Light’s adaptation of Monte Cristo, and this organization is very much worth checking out for their innovation and willingness to take risks and play outside the box. A young female playwright makes a promising, colorful debut with The Bats, The Flea's resident acting company.